Approval Certificates from Transport Canada, The European Aviation Safety Agency, and the US Department of Transportation, as an Approved Maintenance Organization, Components Category. "There When You Need Us". 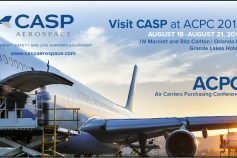 Company information on CASP Aerospace. Products, Services, Regulatory approvals, Factory approvals, major customers. Company information on CASP Aerospace. Products, Services, Regulatory approvals, Factory approvals, major customers. Self survey form listing CASP Aerospace's capabilities, including certifications, quality control items, inspection, tools and calibration, etc. Oxycrew Series : PBEs, Oxycrew CAS. Material safety data sheet. Specifications and handling of carbon dioxide. Material safety data sheet. Specifications and handling of hexafluoropropane in pressurized container. Fire extinguisher material safety data sheet. Specifications, hazards, handling & storage, first aid measures for recycled Halon 1211 (Bromotrifluoromethane) in a pressurized container. Safety Data Sheet covering compressed air equipment under the trade names Air, Medipure© Air, and Plasma Air. Material safety data sheet. Hazards identification, first aid and firefighting measures, etc. Material safety data sheet. Specifications, hazards, handling & storage, first aid measures for Halocarbon 13 B1 (Bromotrifluoromethane). Praxair material safety data sheet. Specifications, hazards, handling & storage, first aid measures for dealing with helium. Praxair material safety data sheet. Specifications, hazards, handling & storage, first aid measures for dealing with nitrogen. Praxair material safety data sheet. Specifications, hazards, handling & storage, first aid measures for dealing with oxygen.